Sri Sritharan, InTrans research faculty affiliate and Wilson Engineering Professor in the Department of Civil, Construction, and Environmental Engineering, returned March 7 from a reconnaissance trip to earthquake-ravaged Christchurch, New Zealand. On February 22 a magnitude 6.3 earthquake occurred with its epicenter about six miles southeast of Christchurch, killing 166 people. Sritharan traveled to Christchurch as part of a team from the Earthquake Engineering Research Institute‘s Learning from Earthquakes Program. The trip was supported by the National Science Foundation. Although his primary objective was to study the earthquake’s impacts on buildings (see related article), Sritharan also made several observations about the condition of roadways, bridges, and traffic in Christchurch, a city about the size of Des Moines, Iowa. Of the relatively few bridges in the city, only two were severely damaged. Sritharan visited one of them, an overpass constructed of reinforced concrete with precast components. The older bridge, which had not been upgraded for seismic stresses, experienced major damage at the ground-level base of the columns. A nearby parking structure had collapsed under the stresses. Sritharan said, “Decisions regarding seismic upgrades are based on a variety of factors. Christchurch’s level of seismic precaution regarding its infrastructure is not quite as high as, say, Wellington’s.” Wellington, the capital of New Zealand, is about 260 miles northeast of Christchurch. 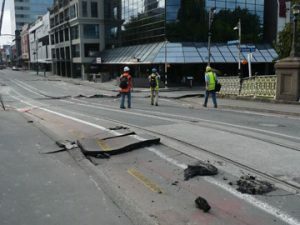 The city’s street and road infrastructure experienced serious damage. “Significant liquefaction occurred in Christchurch,” Sritharan explained. When seismic vibrations pass through solid ground, the resulting decrease in soil volume literally liquifies the soil, and it loses its ability to support loads. Many neighborhoods experienced heaved and cracked pavements, with drop-offs or projections up to 18 inches, Sritharan estimated. He noted that Christchurch experienced more damage than another community that is closer to the epicenter of the Feb. 22 earthquake. One possible explanation is that Christchurch may have experienced the “valley effect,” an amplification of seismic activity in low, flat areas or valleys. “The efficiency of the city’s administrative response was impressive,” Sritharan said. Within hours of the event, a state of national emergency was declared, the heavily damaged central business district was cordoned off, and civil defense authorities were controlling access. Tight traffic control by police and military personnel allowed only critical responders, like Sritharan’s group of inspectors, access to the most severely damaged areas. The size of the restricted area has since been reduced somewhat, but Sritharan believes that the state of emergency will remain for several weeks. Cookies, bars and punch will be served after the presentation!